OKLAHOMA CITY - The Oklahoma City Dodgers proudly continue their partnership with LifeShare of Oklahoma to join the organization's mission of gaining and educating organ donors in the state of Oklahoma. April is National Donate Life Month, which coincides with the start of the OKC Dodgers baseball season, and guests to Chickasaw Bricktown Ballpark can sign up during any Dodgers' 2019 home game to become LifeShare Everlasting Fans. 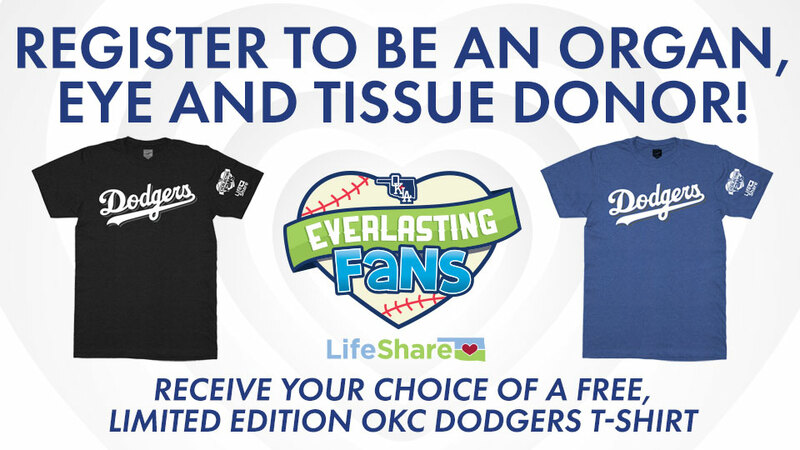 Throughout the 2019 season, fans who sign up to become an organ donor during an OKC Dodgers game will receive an exclusive LifeShare Everlasting Fans T-Shirt by visiting the promotions table located on the concourse behind section 110. Last season, more than 1,400 people registered to become an organ donor at OKC Dodgers games. "We are excited to continue our partnership with the Oklahoma City Dodgers this season," said Jeffrey Orlowski, President and CEO of LifeShare of Oklahoma. "Allowing fans to register their decision to be a donor at Dodgers home games gives hope to nearly 700 Oklahomans waiting on a lifesaving transplant." National Donate Life Month began in 2003 and is celebrated in April to "help encourage Americans to register as organ, eye and tissue donors and to celebrate those that have saved lives through the gift of donation," according to the Donate Life America website. LifeShare of Oklahoma was created in 1986 and is a nonprofit, federally designed organ procurement organization dedicated to the recovery of organs and tissue for transplant purposes. LifeShare works closely with five transplant centers and 145 health care organizations in Oklahoma to facilitate donation. LifeShare of Oklahoma strives "to raise awareness for organ, eye and tissue donation through public education," according to the organization's website. The OKC Dodgers open their second homestand of the season Tuesday against the Omaha Storm Chasers at 7:05 p.m. at Chickasaw Bricktown Ballpark, followed by a 7:05 p.m. game Wednesday between the teams. The Dodgers wrap up their three-game series against Omaha at 7:05 p.m. on a $2 Thursday, featuring $2 Pepsi products, bottled water and select beer. Oklahoma City remains home and opens a four-game series against the Iowa Cubs at 7:05 p.m. Friday, with fireworks scheduled to follow the game, presented by True Sky Credit Union. In addition to fireworks, the fun, inflatable characters of the ZOOperstars! will dance, perform acrobatics, tricks and comedy on the field between innings. Saturday's 7:05 p.m. game is 89ers Night and players and coaches will wear jerseys and hats inspired by original Oklahoma City 89ers gear. The game-worn jerseys will then be auctioned off via silent auction to benefit the OKC Dodgers Baseball Foundation. The 89ers played at All Sports Stadium from 1962-97, winning two Pacific Coast League titles in 1963 and 1965, and two American Association titles in 1992 and 1996 before the franchise relocated to Chickasaw Bricktown Ballpark in 1998. Sunday's 2:05 p.m. game falls on a Chaparral Energy Family Sunday, featuring pregame player autographs, a mascot meet-and-greet, face painters, inflatables and postgame kids run the bases. The homestand then wraps up with a 7:05 p.m. game Monday, April 22. OKC Dodgers tickets are available through the OKC Dodgers ticket office located on South Mickey Mantle Drive, by phone at (405) 218-2182, or by visiting okcdodgers.com.